Time-tested advantages won’t go out of style. To further illustrate the legibility issues discussed on the previous page, plus related factors affecting aesthetics, we’ve put all the details into chart form below for clear examination. The chart shows visual depictions and point-by-point comparisons of 3M’s default digital license plate font (on the right) with Keystone State (on the left), the latter a cleaned-up digital interpretation of the state of Pennsylvania’s traditional embossed font, which has stood the test of time over several decades since 1958. Below the chart we discuss one additional consideration: a potential profit-driven reason that 3M might have selected such an overly narrow font for its digital license plate system, assuming it wasn’t just lack of knowledge. 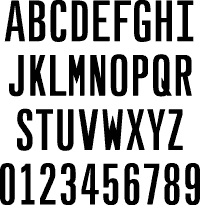 Then, to provide assistance for those anticipating a transition to digital plates, on the following page we’ll cover better digital fonts for flat license plates that a few states are using instead of 3M’s default font. Similar to many states’ traditional fonts, Keystone State is less condensed than 3M’s default font with more interior space (“counterspace”). The digital recreation above has an improved M, R, and W compared to Pennsylvania’s original embossed font. Keystone State’s larger counters (enclosed areas) mean more visual separation between strokes. Result: More easily distinguished shapes, with strokes that don’t as easily blur together visually at a distance or when visibility is poor (dim light, inclement weather, older eyes, etc.). The human eye is tolerant of condensed letterforms up to a point. However, other things being equal, the more condensed a typeface is, the less counterspace (interior space) it has, reducing legibility. 3M’s font is considerably more condensed than traditional license plate fonts — much more than it needs to be for plate numbers to fit in the available space. Result: noticeably less counterspace and legibility. Keystone State’s wider variety of character sub-shapes creates more distinctive, easily recognizable characters. 3M’s font’s highly regularized construction with exactly (or nearly exactly) repeated forms throughout the character set results in a more “modern,” precision look, but at the cost of more repeated shapes that negatively impact legibility at a distance. 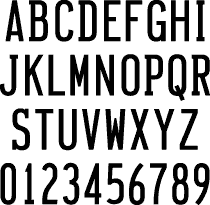 The oval-shaped curves of Keystone State’s numbers make them more distinctive and easier to differentiate from the “rounded square” curves that the alpha characters are created with. The difference can be helpful when numbers are not grouped separately on the plate from alpha characters. But another benefit is it simply contributes to more variety in character shapes in the font overall. C, G, 2, 3, 5, 6, and 9 in Keystone State are more unique in context than in 3M’s default font because of the distinct angle at which their curved strokes terminate compared to horizontal/ vertical strokes. The serifs added to Keystone State’s capital B make it more easily distinguishable from numeral 8 at a distance compared to 3M’s default font. D is more distinct from capital O in Keystone State than 3M’s font because of the added serifs. G’s lower-right sub-shape is more unique in Keystone State than 3M’s font. I and 1 Short serifs at top and bottom of “I”. Short upper flag on numeral “1”. Wide serifs at top and bottom of “I”. Medium upper flag on numeral “1”. Keystone State’s “I” isn’t as distinct from numeral “1” as it could be. The bottom serifs of “I” and “1” match each other almost exactly, while the top serif of “1” could be larger for easier distinguishability. 3M’s font’s wide serifs on “I” clearly distinguish it from “1”, although they are needlessly exaggerated, detracting from the appearance. The double junction in Keystone State’s K opens up more interior space in lower half of character compared to 3M’s default font. The intersection of the latter’s double junction (altered from the original Zurich K) instead of opening up significant white space creates an overly black spot in the middle of the character. Serifs in Keystone State’s R add to its uniqueness in the context of other characters compared to 3M’s default font. A good decision here by 3M with its default font was to use a modified form of its progenitor Zurich’s R by adding an angled right leg to make it less easily confused with B.
Keystone State’s capital S is more easily distinguished from numeral 5 because of the added serifs on letter S.
All of the numerals in 3M’s font with a curved finishing stroke (2, 3, 5, 6, 9) terminate exactly the same way, making them less distinctly different. Keystone State’s 7 is more quickly identifiable with its unique curved diagonal. Other things being equal (an important caveat), more varied features create heightened visual interest, while more uniform or regularized features cause more monotony or at least a “quieter” or more nondescript appearance. Regularized features are more typical of text typefaces like Zurich, which 3M’s font was based on, so that the font design purposely calls less attention to itself and doesn’t get in the way of an immersive reading experience. The downside, however, tends to be a less visually interesting look and feel when used in larger sizes. Hand-wrought appearance evokes sense of history and craft, while mechanical finish suggests impersonal modernity. Provided they are craftsmanlike and not sloppily done, handcrafted items tend to have a human charm or character. Mechanical appearance may look rigid or lifeless if not well-executed or done without flair. Keystone State Relative, type designer Anuthin Wongsunkakon’s cleaned-up interpretation of Pennsylvania’s embossed font, has been refined so that all characters work together harmoniously. About two-thirds of 3M’s default font alpha characters were inherited from Zurich as is, the other third are hatchet jobs. Note for example how K, M, N, V, and W contain distracting “black spots” in the center of each character, due to unprofessional alteration of the original text typeface Zurich for license plate use. as a model for 3M’s default font? Why select an overly narrow, less legible font? With the above reasons against adapting a typeface like Zurich Extra Condensed for license plate use, it is puzzling why 3M would have selected it as the basis for its default font. Not only does it suffer the various problems noted above that negatively impact signage legibility, but it’s much more condensed than necessary for fitting plate numbers into the traditional amount of space allotted for them on a license plate. Since there’s no reason for that based on legibility (in fact, clear reason against it), that leaves either ignorance about legibility issues or some other reason perhaps. Ulterior motive: Selling digital graphics at the expense of legibility? After looking at numerous examples of 3M’s plates that have been produced by various states (see these Montana plates, for instance), one thing that becomes apparent is the increased use of graphics on digital plates compared to traditional tags. It appears that the smaller amount of horizontal space required by 3M’s font may be allowing/ encouraging states to fill up the remaining plate space with graphics, while legibility suffers. Since “special issue” plates that make use of more graphics are a source of extra revenue for states, we believe it’s possible that 3M may be using the “narrower font = more graphics” equation as a “selling point” for its system. Revolutionary new/old concept: Plates that can be read easily. Whether the use of an extra-narrow font to enable more graphics is intentional on 3M’s part or not, if you are someone at your state’s Division of Motor Vehicles evaluating digital plates for use, don’t be misled by sales pitches or consulting advice emphasizing graphics at the expense of legibility. (For further commentary related to this point, see “License to Obscure,” by prominent type designer Mark Simonson. A couple of helpful legibility examples are included comparing his home state’s traditional plate and font vs. two recent almost impossible-to-read graphics-heavy special-issue plates produced with 3M’s digital system and default font.) Graphics are fine, but whatever system you buy, legibility should be the higher priority in balancing plate numbers and graphics with each other. Your law enforcement people will thank you for more easy-to-identify plates. And citizens will like the new plates if they have better-looking license plate numbers as well.